Jennifer Newland is sharing her Stamp Collection with us for the month of February. 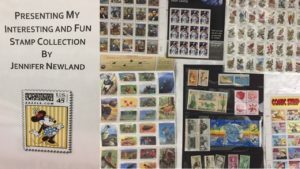 She has been collecting stamps since the 1980’s and has quite a variety, as you will see, when you stop by the display case upstairs. The library has a collection of Standard Postage Stamp Catalogs which can be found in the Reference section, if you’d like to learn more about Stamp Collecting.